On the listing page, you may either create new products or edit existing ones. 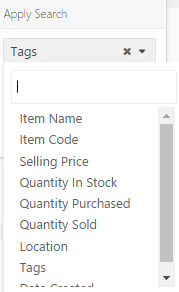 Products in the listing page can be sorted in ascending or descending order by clicking the respective field header labels. Filtering can be performed by using the Search filter text field. Enter the desired keywords into the text field, any keyword matches against the following fields will be displayed in the listing page. Products can be ‘branded’ with custom keyword tags for a more specific search result. E.g. Create or update a product and enter ‘High turnover’ into the Tag field. In the listing page, you can enter ‘High turnover’ into the Search text field and all products with the tag ‘High turnover’ will be displayed. Multiple tags can be separated by commas. After which the search criteria can be saved for the convenience of subsequent searches with the same keyword. This comes in handy if you often need to search for specific records such as all products from a specific supplier.